Step 1. Create a creditscorecard object. Step 2a. Automatically bin the data. Step 2b. Fine-tune the bins using manual binning. Step 3. Fit a logistic regression model. Step 4. Review and format scorecard points. Step 5. Score the data. Step 6. Calculate the probability of default. This example shows how to create a creditscorecard object, bin data, display, and plot binned data information. This example also shows how to fit a logistic regression model, obtain a score for the scorecard model, and determine the probabilities of default and validate the credit scorecard model using three different metrics. Use the CreditCardData.mat file to load the data (using a dataset from Refaat 2011). 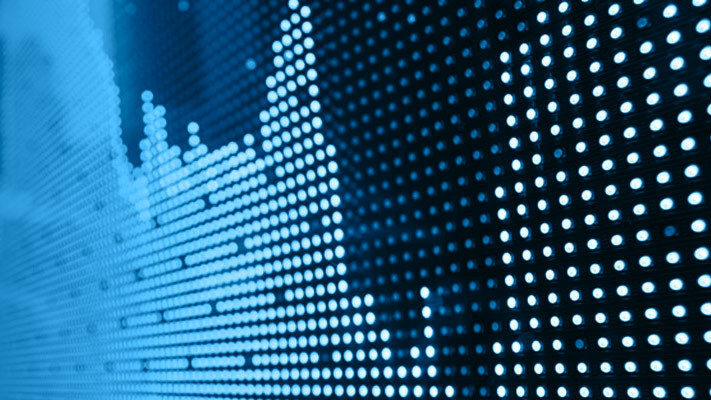 If your data contains many predictors, you can first use screenpredictors from Risk Management Toolbox™ to pare down a potentially large set of predictors to a subset that is most predictive of the credit scorecard response variable. Use can then use this subset of predictors when creating the creditscorecard object. When creating a creditscorecard object, by default, 'ResponseVar' is set to the last column in the data ('status' in this example) and the 'GoodLabel' to the response value with the highest count (0 in this example). 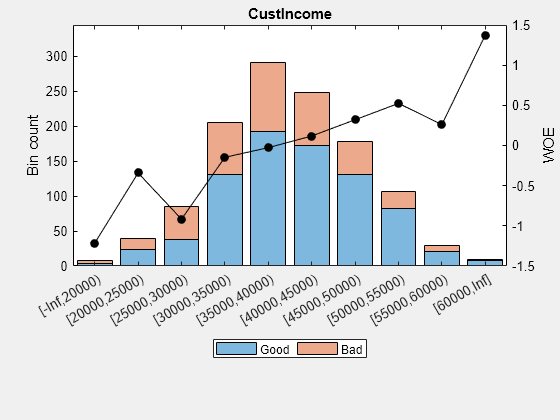 The syntax for creditscorecard indicates that 'CustID' is the 'IDVar' to remove from the list of predictors. Also, while not demonstrated in this example, when creating a creditscorecard object using creditscorecard, you can use the optional name-value pair argument 'WeightsVar' to specify observation (sample) weights or 'BinMissingData' to bin missing data. Perform some initial data exploration. 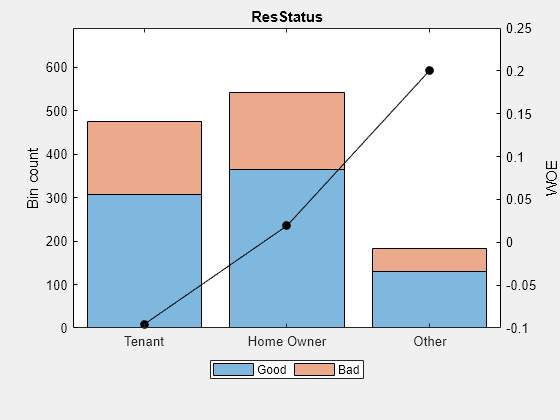 Inquire about predictor statistics for the categorical variable 'ResStatus' and plot the bin information for 'ResStatus'. 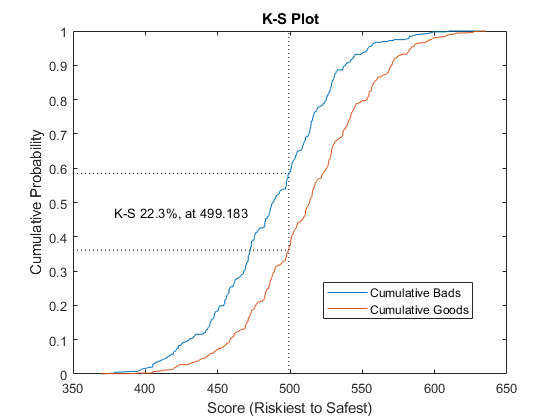 This bin information contains the frequencies of “Good” and “Bad,” and bin statistics. Avoid having bins with frequencies of zero because they lead to infinite or undefined (NaN) statistics. Use the modifybins or autobinning functions to bin the data accordingly. For numeric data, a common first step is "fine classing." This means binning the data into several bins, defined with a regular grid. 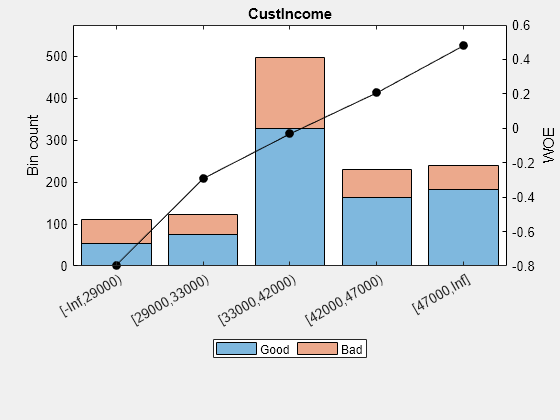 To illustrate this point, use the predictor 'CustIncome'. Use the autobinning function to perform automatic binning for every predictor variable, using the default 'Monotone' algorithm with default algorithm options. After the automatic binning step, every predictor bin must be reviewed using the bininfo and plotbins functions and fine-tuned. A monotonic, ideally linear trend in the Weight of Evidence (WOE) is desirable for credit scorecards because this translates into linear points for a given predictor. The WOE trends can be visualized using plotbins. 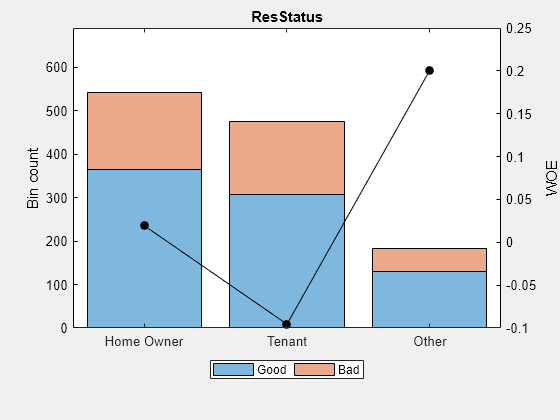 Unlike the initial plot of 'ResStatus' when the scorecard was created, the new plot for 'ResStatus' shows an increasing WOE trend. This is because the autobinning function, by default, sorts the order of the categories by increasing odds. These plots show that the 'Monotone' algorithm does a good job finding monotone WOE trends for this dataset. To complete the binning process, it is necessary to make only a few manual adjustments for some predictors using the modifybins function. Use the bininfo function with two output arguments where the second argument contains binning rules. 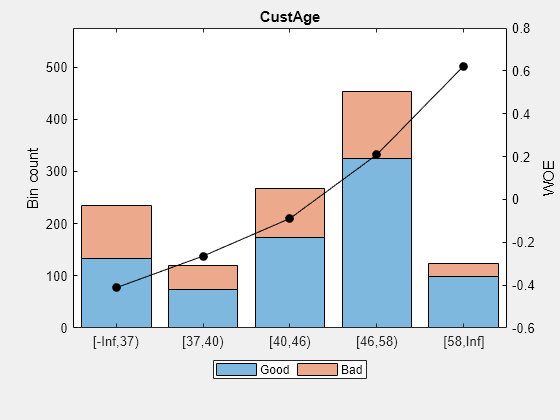 Manually modify the binning rules using the second output argument from bininfo. Set the updated binning rules with modifybins and then use plotbins or bininfo to review the updated bins. 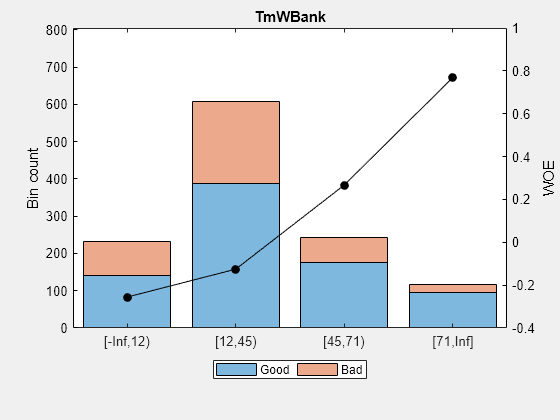 Now that the binning fine-tuning is completed, the bins for all predictors have close-to-linear WOE trends. The fitmodel function fits a logistic regression model to the WOE data. fitmodel internally bins the training data, transforms it into WOE values, maps the response variable so that 'Good' is 1, and fits a linear logistic regression model. By default, fitmodel uses a stepwise procedure to determine which predictors should be in the model. 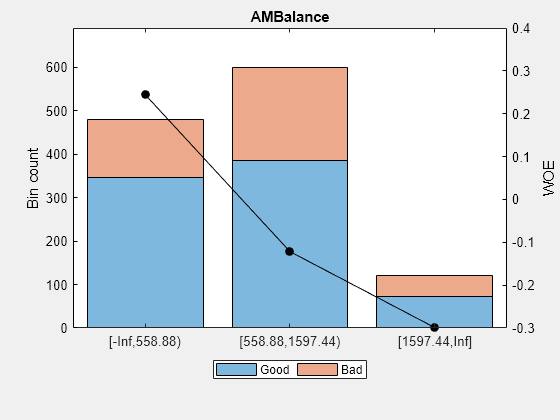 After fitting the logistic model, by default the points are unscaled and come directly from the combination of WOE values and model coefficients. The displaypoints function summarizes the scorecard points. This is a good time to modify the bin labels, if this is something of interest for cosmetic reasons. To do so, use modifybins to change the bin labels. Points are usually scaled and also often rounded. To do this, use the formatpoints function. For example, you can set a target level of points corresponding to a target odds level and also set the required points-to-double-the-odds (PDO). The score function computes the scores for the training data. An optional data input can also be passed to score, for example, validation data. The points per predictor for each customer are provided as an optional output. To calculate the probability of default, use the probdefault function. 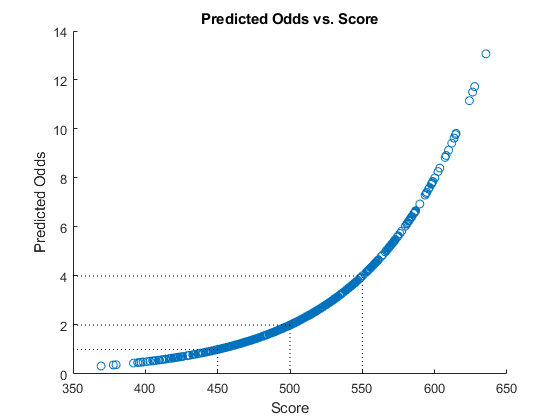 Define the probability of being “Good” and plot the predicted odds versus the formatted scores. Visually analyze that the target points and target odds match and that the points-to-double-the-odds (PDO) relationship holds. 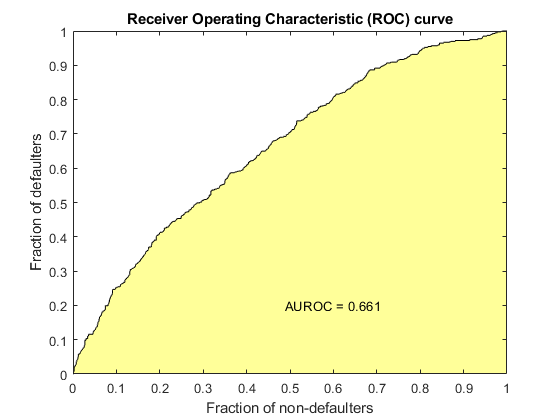 The creditscorecard class supports three validation methods, the Cumulative Accuracy Profile (CAP), the Receiver Operating Characteristic (ROC), and the Kolmogorov-Smirnov (K-S) statistic. 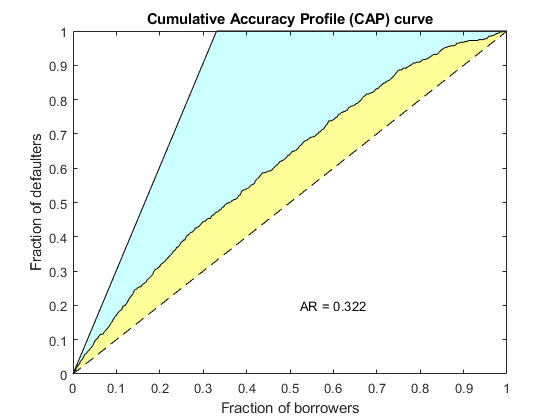 For more information on CAP, ROC, and KS, see Cumulative Accuracy Profile (CAP), Receiver Operating Characteristic (ROC), and Kolmogorov-Smirnov statistic (KS).